to train with some of the highest ranking Instructors in Canada.He has also trainedwith several International Instructors including Kancho Matsui,Shihan Bobby Lowe in Hawaii and several others from around the world. He has also trained in Los Angeles, Hawaii and Japan He graded for Shodan in 1999and in 2009 Steve successfully graded for his Nidan. Promoted to Sandan - August 2013. Chris is our most senior student of the dojo at 1st Kyu. Chris has competed in several knockdown tournaments and has trained at several events including Summer Camp, Winter Camp, Fall Camp, as well as attending 2 North American Black Belt Conferences. Chris has been a member since November 2004, he joined the dojo as a 6th Kyu student from the Dawson Creek Dojo. 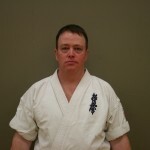 Promoted to Shodan - August 2013. 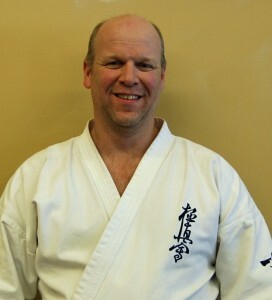 Jim is one of our senior belts, obtaining 1st Kyu in December 2011. He has been a devoted member since September 2005. Competing in several local tournaments, attending camps and most recently the World tournament and Mt. Mitsumine Camp in Toyko Japan. In addition to Instructing classes, coaching, website design and Fall Camp coordinator, Jim has found a new passion in Tournament Judging. 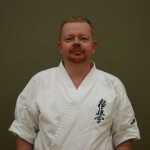 Promoted to Shodan - August 2013. 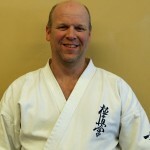 Derek is one of our senior belts, obtaining 2nd Kyu in December 2011. He has been a devoted member since September 2006. Derek has competed as well as coached in several local tournaments. He has attended summer, fall and winter camps. In addition to instructing in the dojo, Derek has also helped in instructing several womens self defense courses. 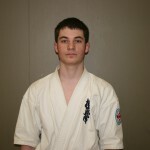 Robin is one of our senior belts, obtaining 2nd Kyu in December 2011. 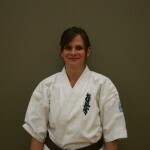 She has been an active member since September 2006 often assisting with Junior and Adult classes. Robin has attended Summer, Fall and Winter camp. The Stony Plain Dojo was established in 2004. The dojo started in the basement of Steve’s brother’s house. After a couple of months it has moved to its present location. The club has grown from meager beginnings to be a well-established Dojo in Alberta. The Stony Plain Dojo is also the host Dojo of the annual IKOK-C Fall Camp. to train with some of the highest ranking Instructors in Canada.He has also trainedwith several International Instructors including Kancho Matsui,Shihan Bobby Lowe in Hawaii and several others from around the world. He has also trained in Los Angeles, Hawaii and Japan He graded for Shodan in 1999and in 2009 Steve successfully graded for his Nidan.